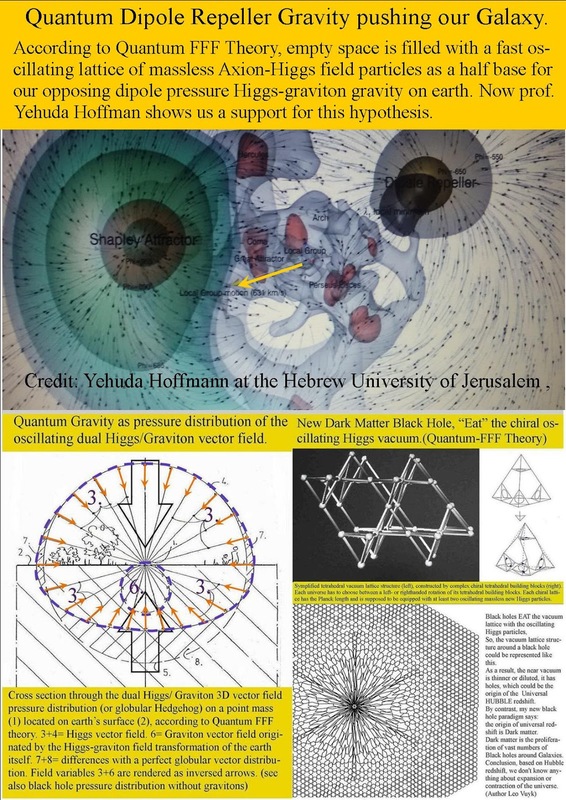 According to professor Jehuda Hoffman it is called Dipole repeller gravity. So translated for Q-FFF Theory::Quantum Dipole Repeller Gravity pushing our Galaxy. 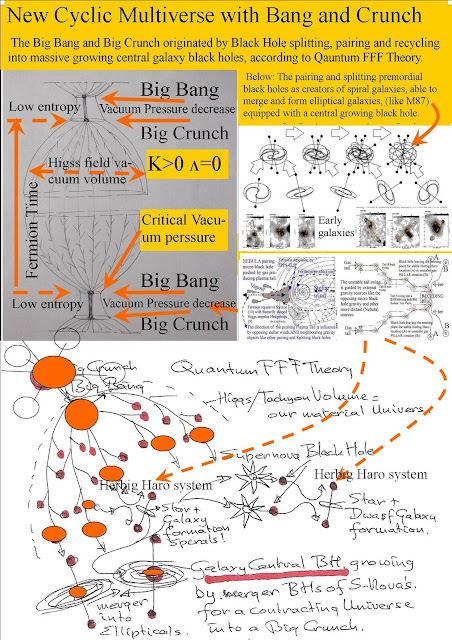 According to Quantum FFF Theory, empty space is filled with a fast oscillating lattice of massless Axion-Higgs field particles as a half base for our opposing dipole pressure Higgs-graviton gravity on earth. Now prof. Yehuda Hoffman shows us a support for this hypothesis. 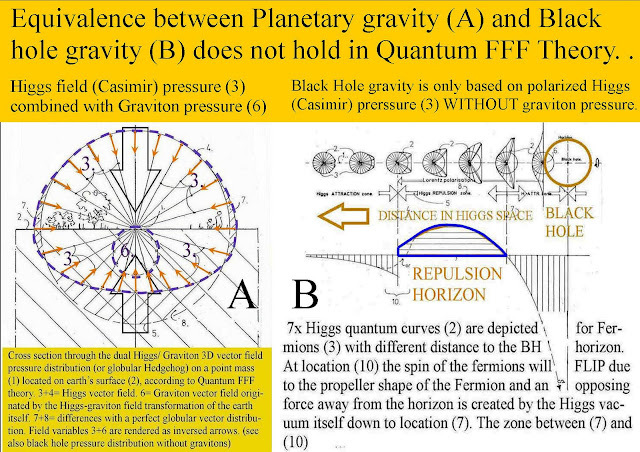 Strong support for DUAL-PUSH-GRAVITY ( Higgs- Graviton) of Quantum FFF Theory. 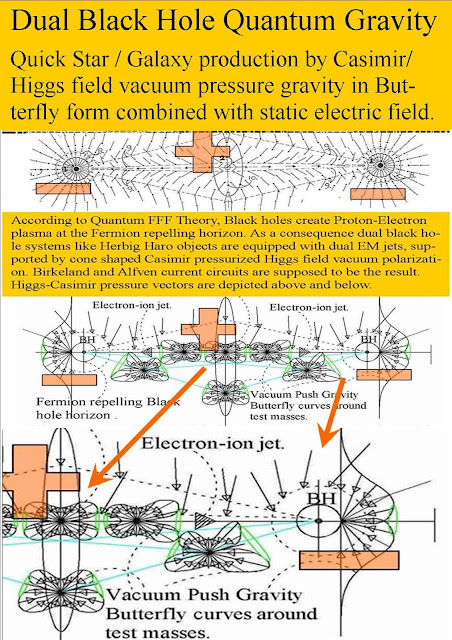 See: "dipole propeller" "Push and Pull drive our Galaxy's Local Group race through Space"
According to Quantum FFF Theory, empty space is filled with a fast oscillating lattice of massless Axion-Higgs field particles ( dark energy) as a half base for our double push Higgs-Graviton gravity on earth. 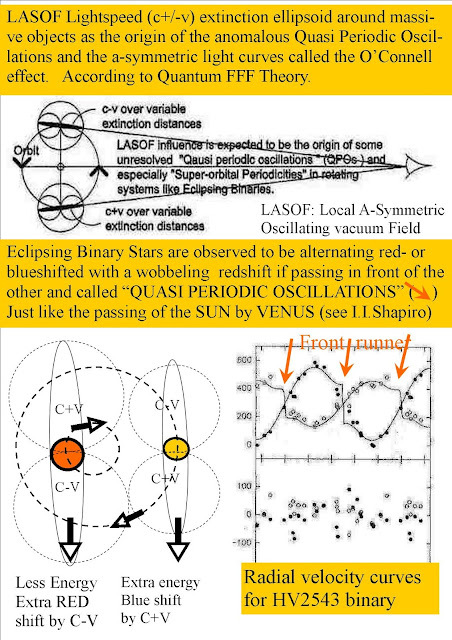 Now prof. Yehuda Hoffman shows us a support for this hypothesis, see below. 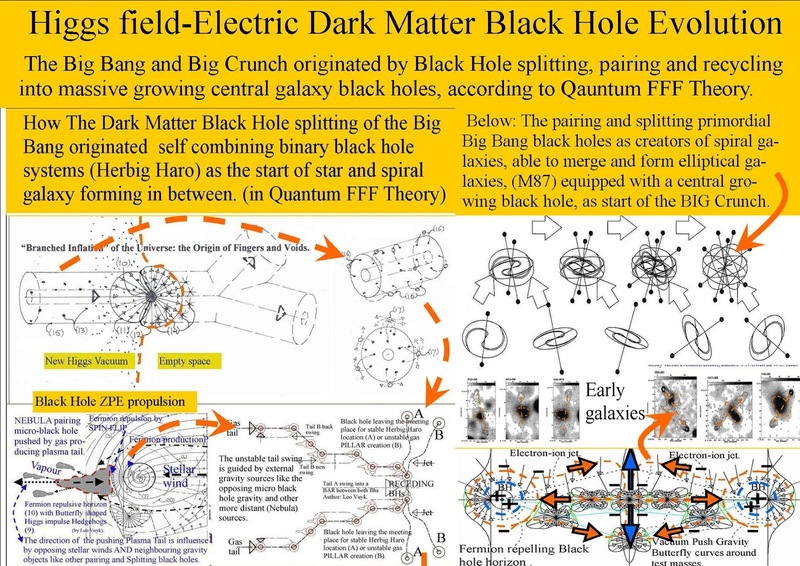 "Empty space" has a higher dark energy filling than space around galaxy clusters, because all black holes EAT the vacuum space.and fermions transform the oscillating Axion-Higgs field into less energetic oscillating Gravitons..
Feynman Diagrams for Dipole Repeller Forces. Attraction and Repulsion forces created by Dipole Repeller effects between the Higgs Field vacuum (OOO) and 5x opposing Photons. 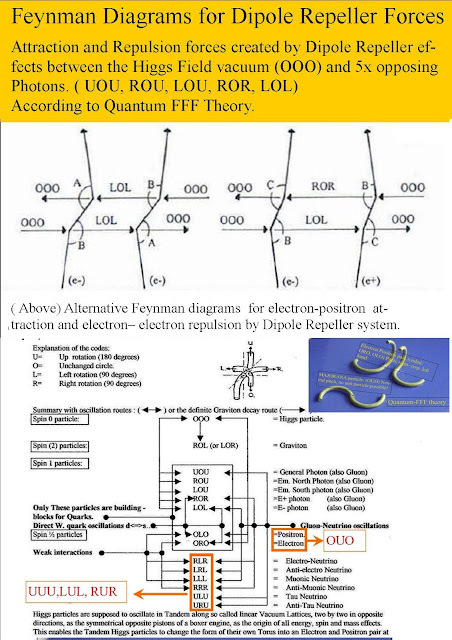 ( UOU, ROU, LOU, ROR, LOL) According to Quantum FFF Theory. Construction principles for chiral “atoms of spacetime” based on geometrical 3-D chiral lattice models and consequences for spacetime, general relativity based space curvature and Time variation, including cyclic Multi- Universal time, and local time. According to Quantum FFF Theory, the fourth dimension (Local Time) seems to be the oscillation based photonic transfer speed (potential time base) of the Higgs doublets along the local Cosmic lattice edges of the vacuum spin field. 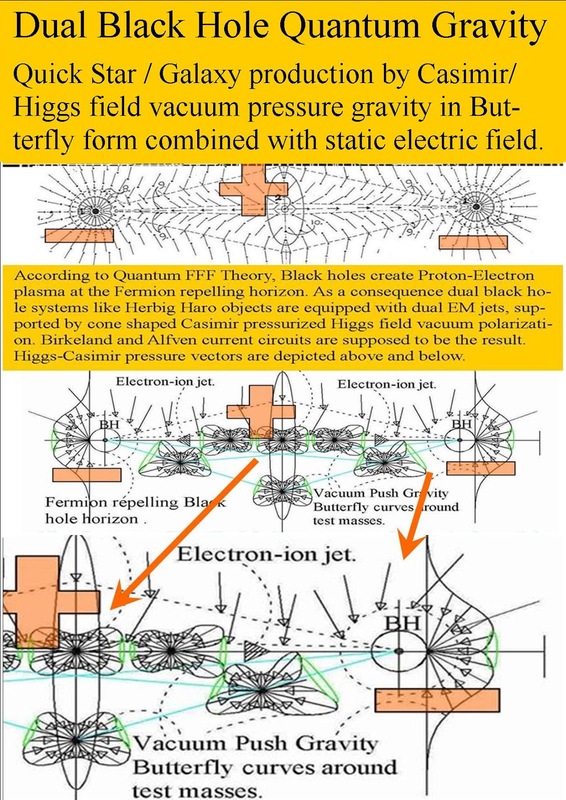 Higgs particle doublets are supposed to oscillate in "tandem" or doublets (like a boxer piston engine) along each vacuum lattice edge, to be able to transfer photonic information properly. This system need to have Higgs particle doublets because otherwise it would be impossible to have a decent information transition system at the information properly. In this system, one lattice edge is supposed to equal one Planck length. The spiral structure of the vacuum lattices gives the vacuum a chiral influence on spinning and merging. 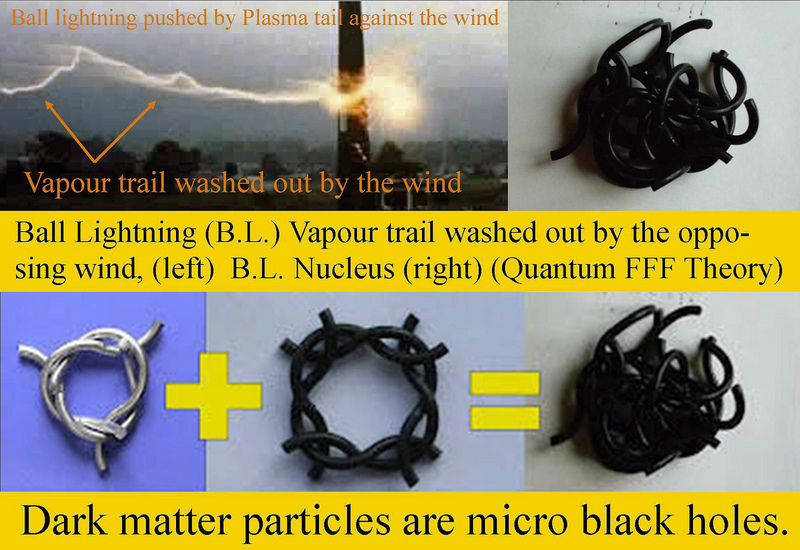 Fermion particles and a photonic polarization. 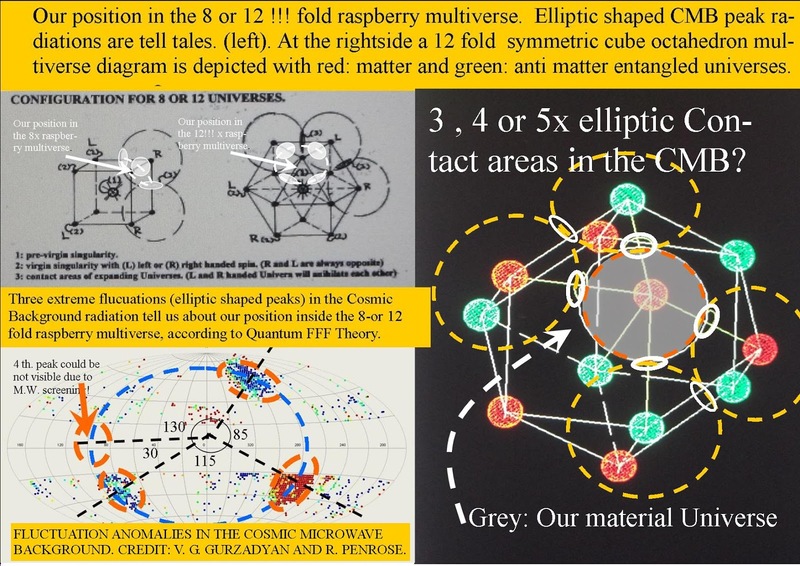 The chirality of this system is supposed to be the origin of our material universe as a member ( 8 or 12?) of the symmetric configuration of the raspberry shaped multiverse . Around black holes, the Higgs lattice system will be absorbed by the black hole and as a consequence, the vacuum is thinned and the Planck length will vary and locally even increase!!! 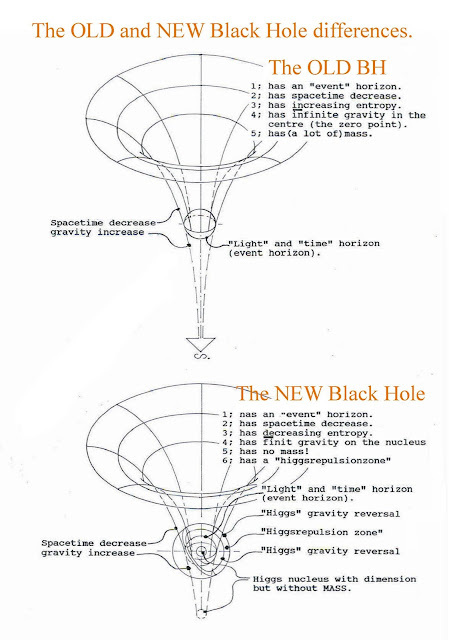 As a consequence, the lightspeed of radiation passing the black hole, will decrease and suffer a redshift. 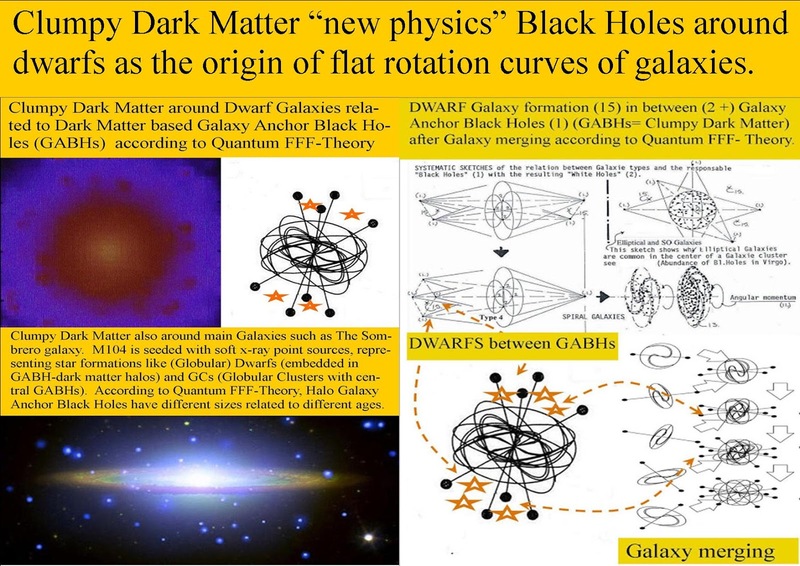 However, if we assume that black holes are the same thing and origin of Dark Matter, then the Hubble redshift is not a tell tale of the expansion of the universe. TIME is assumed to run forward (right-handedness of clocks) because the universe is like a huge pinball machine. 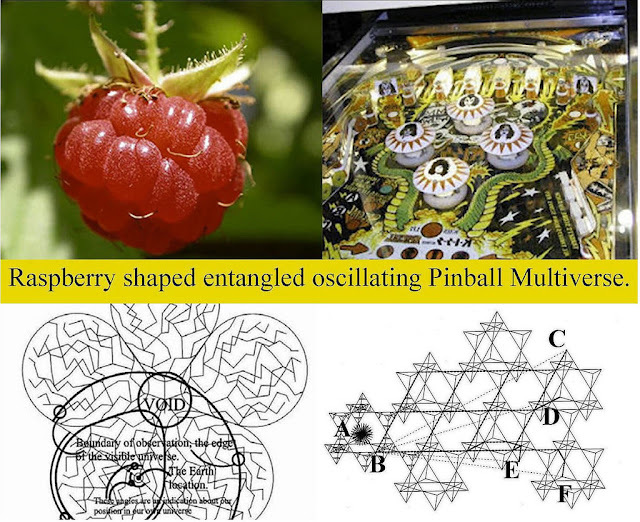 Spinning Fermions (the pinball) are driven by the oscillating Higgs field (the electric springs) which is supposed to be the origin of the general increase of entropy base of the second law of thermodynamics. 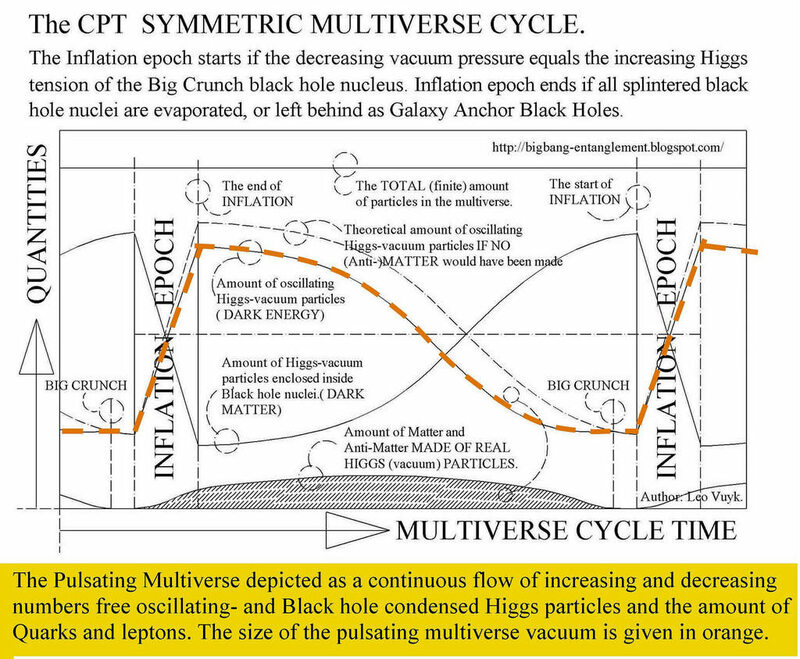 However dark matter in the form of black holes will eat the dark energy of the Higgs field and decrease entropy again, reason to postulate a pulsating and cyclic multi-universe. As a consequence, Time never runs back in anti-material entangled universes, clocks have lefthanded rotation over there and my human copy me, has his hart in my observation at the right side of his body!. IMHO, because we live in one material universe of an 8 or 12 fold CP symmetrical copy multiverse. As a consequence everything is-, even humans are instantaneous entangled with 7 or 11 copies of ourselves. 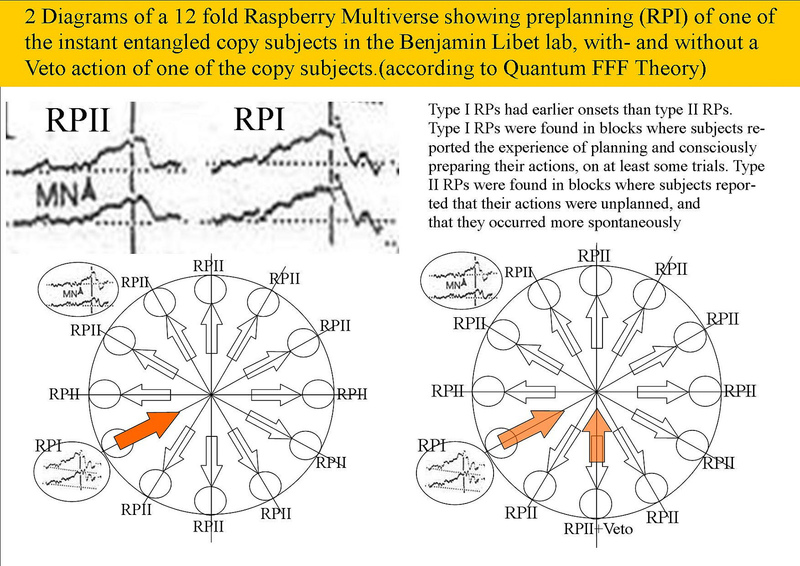 To find out we need to extend a simple experiment already done by B.Libet in 1964.
see: Democratic Free Will and Telepathy in the Instant Entangled Multiverse. 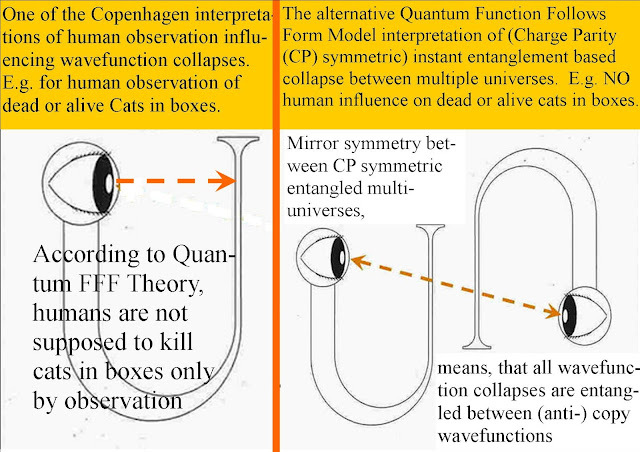 One of the Copenhagen interpretations of human observation influencing wavefunction collapses. E.g. for human observation of dead or alive Cats in boxes. 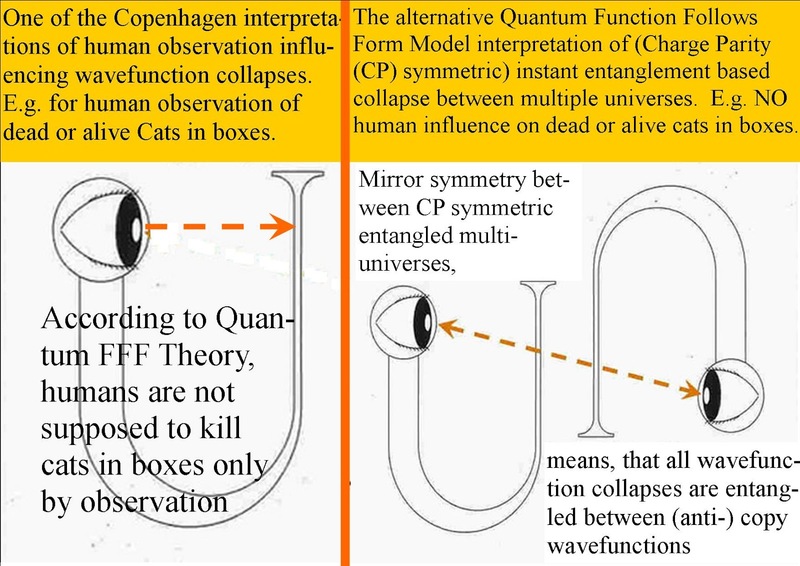 According to Quantum FFF Theory however, humans are not supposed to kill cats in boxes only by observation. 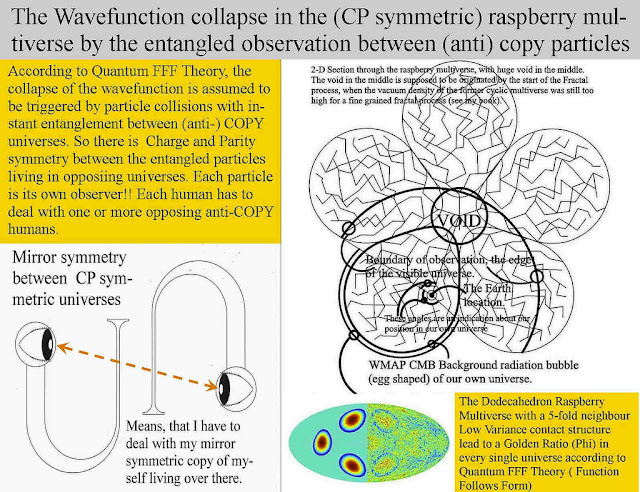 The alternative Quantum Function Follows Form Model interpretation of (Charge Parity (CP) symmetric) instant entanglement based collapse between multiple universes. E.g. NO human influence on dead or alive cats in boxes. 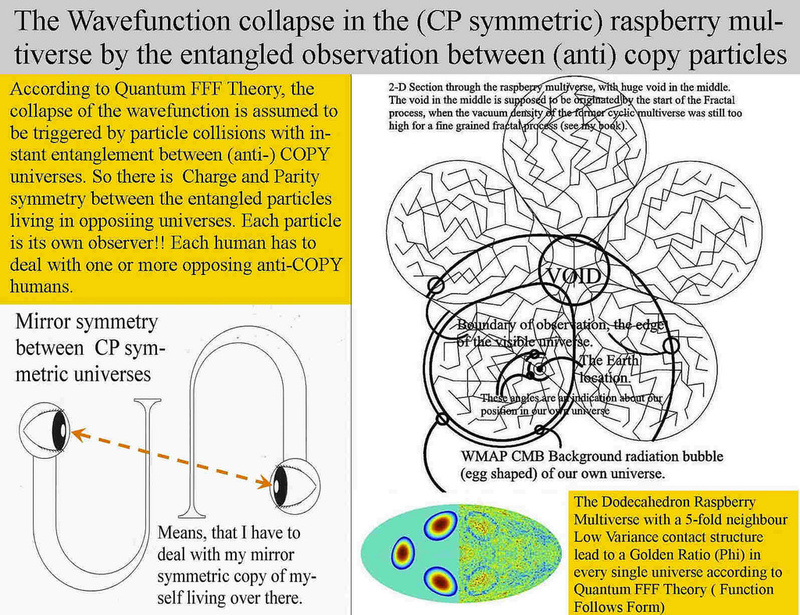 Mirror symmetry between CP symmetric entangled multi-universes, means, that all wavefunction collapses are entangled between (anti-) copy wavefunctions. Single and Dual Black Hole Quantum Gravity. 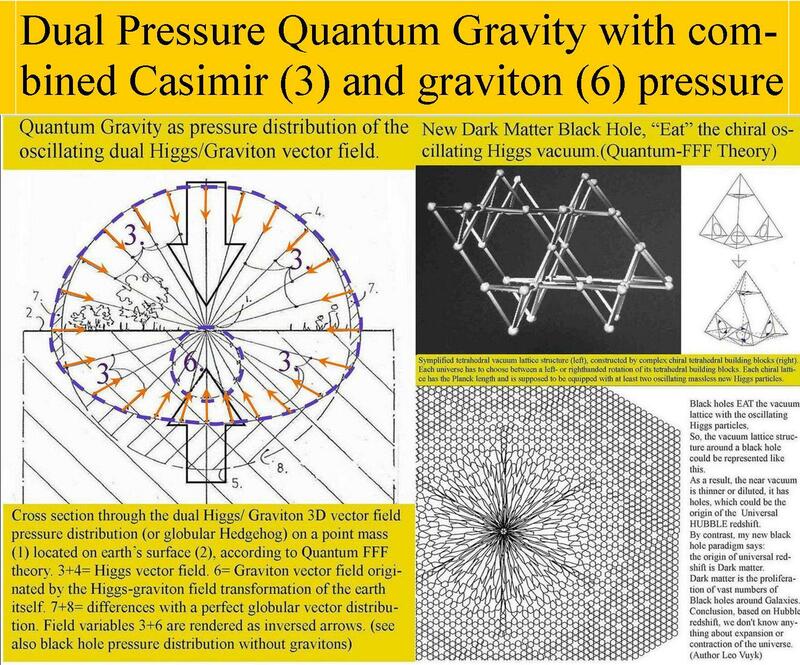 Quick Star / Galaxy production by Casimir/Higgs field vacuum pressure gravity in Butterfly form combined with static electric fields, in between a Dual Herbig Haro black hole system forming a "pressure cooker" effect on plasma dust and gas into the center of the system. dual repulsive vacuum oscillation spectra in FFF-theory. 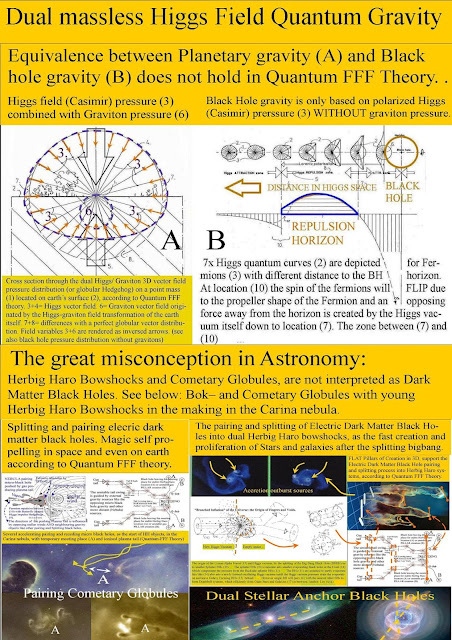 SINGLE Black Hole Quantum Gravity and Plasma creation direct out of the Higgs field. 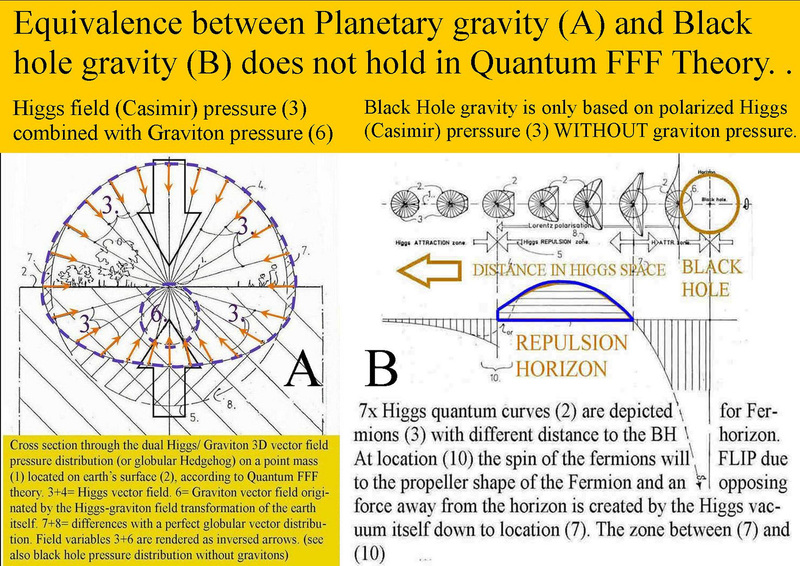 Quantum Gravity should be based of TWO different forces. 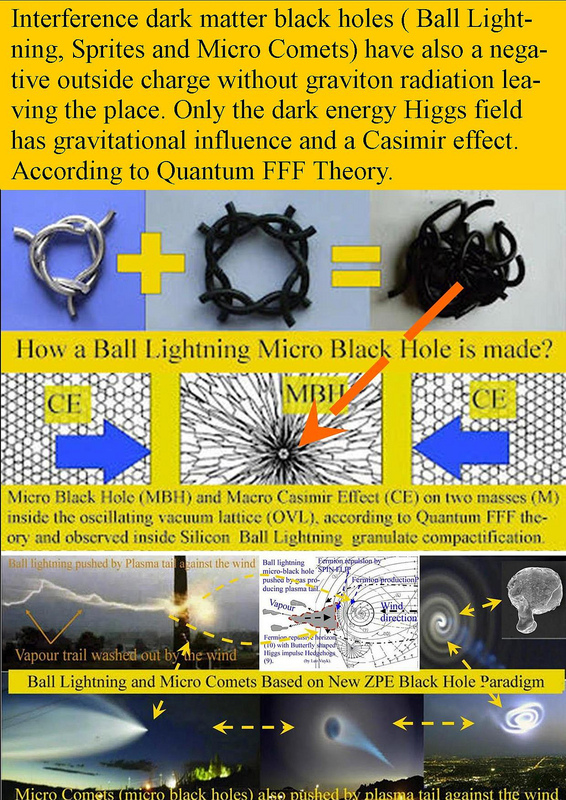 A: The Axon-Higgs field pressure ( also called Casimir effect) created by the oscillating vacuum lattice. 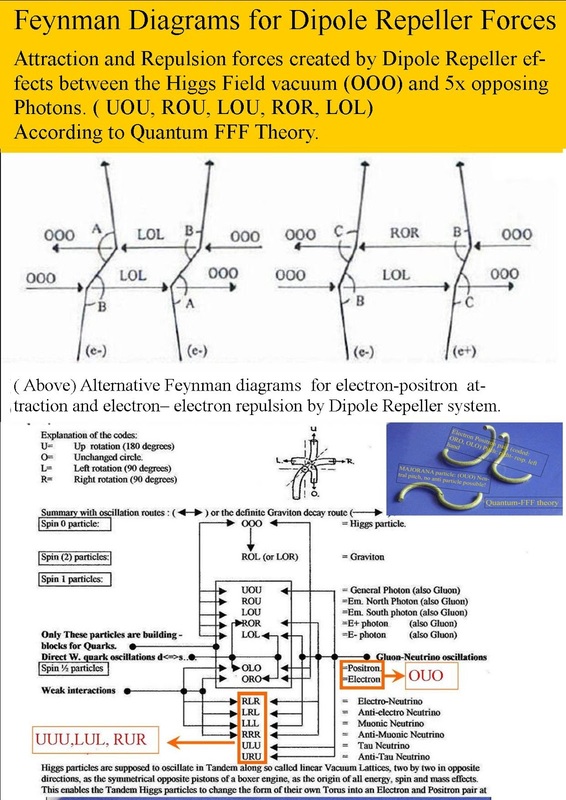 B: The photon based field like the Electro-magnetic transmission field, which is half of the Feynman diagram component . 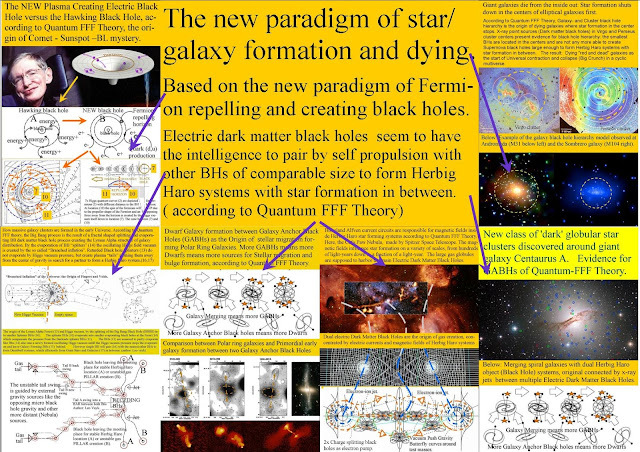 Black Holes have not only hairs, but they repel all propeller shaped rigid string Fermions. 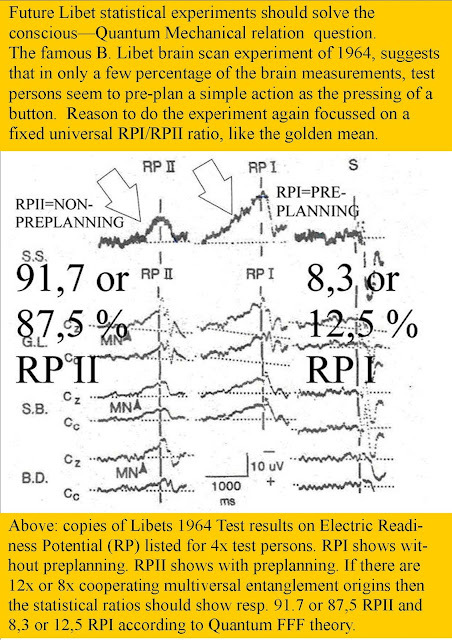 "Benjamin Libet measured the so called electric Readiness Potential (RP) time to perform a volitional act, in the brains of his students and the time of conscious awareness (TCA) of that act, which appeared to come 500 m.sec behind the RP. 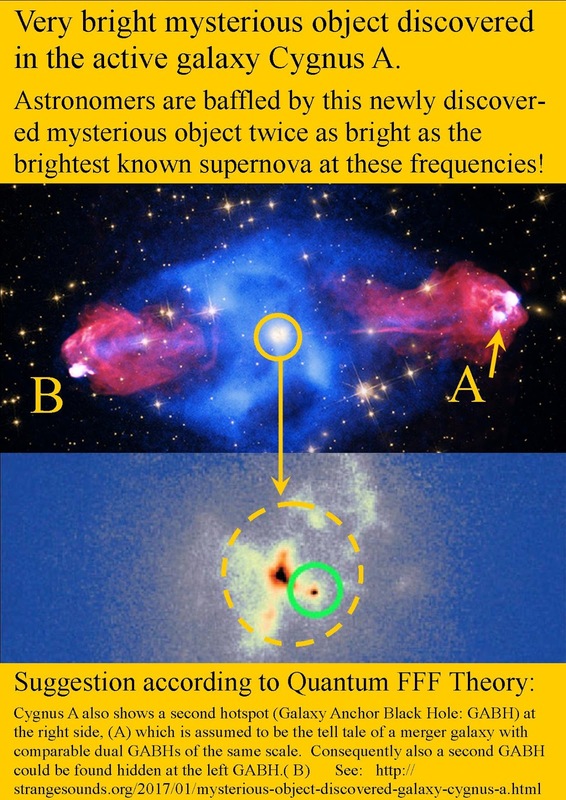 Even Max Tegmark suggested already about the multiverse: “Is there a copy of you reading this article?”"
Very bright mysterious object discovered in the active galaxy Cygnus A.
Astronomers are baffled by this newly discovered mysterious object twice as bright as the brightest known supernova at these frequencies! 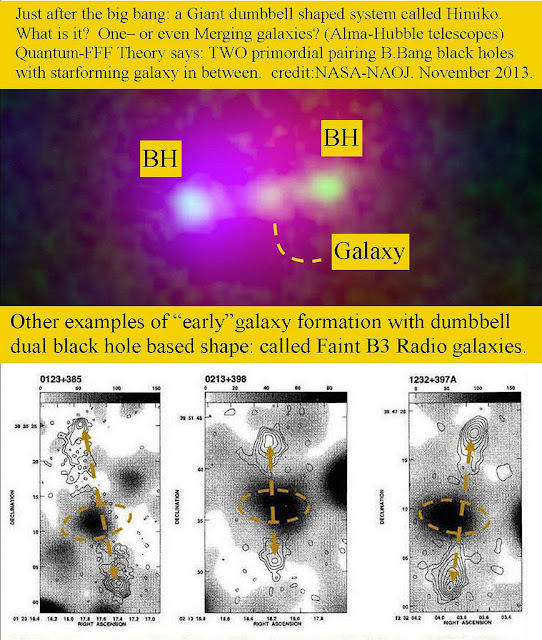 Cygnus A also shows a second hotspot (Galaxy Anchor Black Hole: GABH) at the right side, (A) which is assumed to be the tell tale of a merger galaxy with comparable dual GABHs ( hotspots) of the same scale. 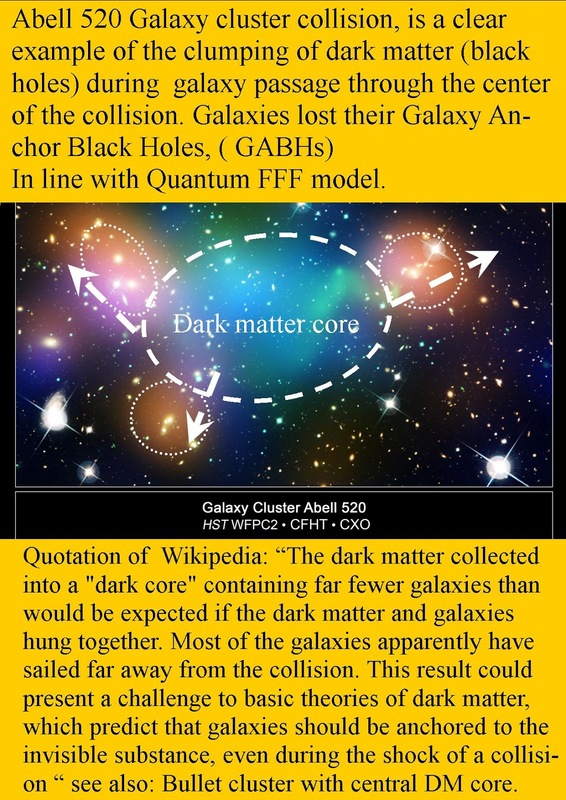 The origin of Galaxy killing in clusters according to Q-FFF Theory. "T.Brown": We conclude that the observed decrease of gas content in the Galaxy group and cluster environments cannot be reproduced by starvation of the gas supply alone and invoke fast acting processes such as ram-pressure stripping of cold gas to explain this." 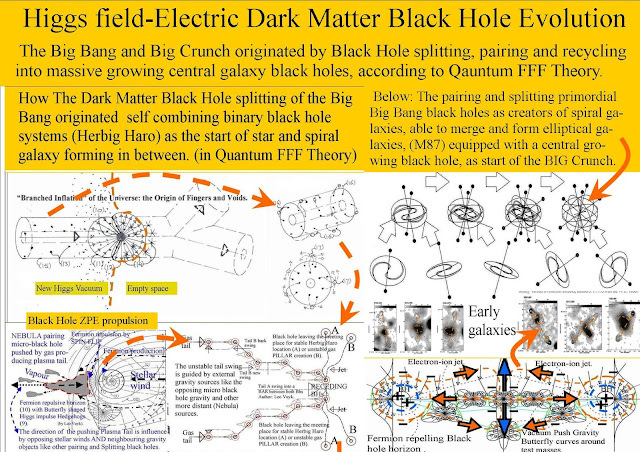 Ram Pressure Stripping (Galaxy killing) is supposed to be originated, by the increasing electric/ spacetime complexity inside the network of external electric dark matter black holes (or: GABHs: Galaxy Anchor Black Holes) around multiple merged cluster galaxies. The complexity is supposed to kill the formation of dual black hole based linear electric Herbig Haro (HH) systems! HH systems are supposed to form a central star forming pressure cooker effect. 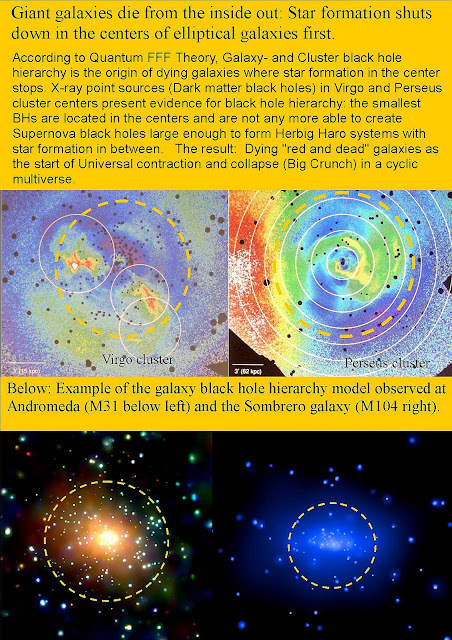 Galaxy cluster killing seem to be a support for a cyclic universe and the start of the Big Crunch! However, not only inside the center of galaxy clusters, star formation is shut down by the increasing complexity of black hole population but also in the center of complex elliptical galaxies, this effect is observed! 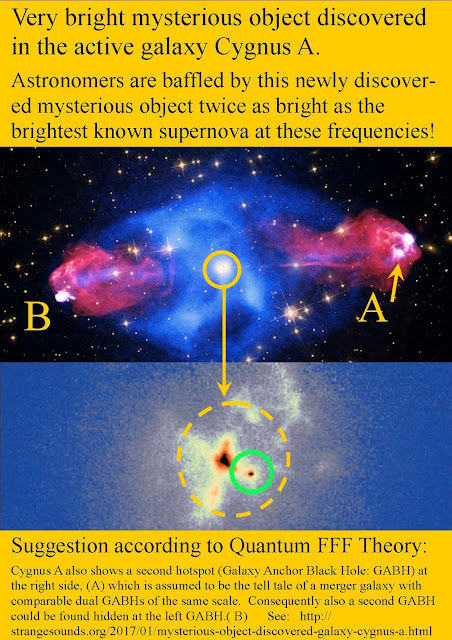 Red and Dead Galaxies as the start of the Universal contraction and Big Crunch. ALL Black Hole sizes seem to be are allowed: from Big Bang related Lyman Alpha Forest BHs, down to Lightning channel Micro (interference) BHs!! 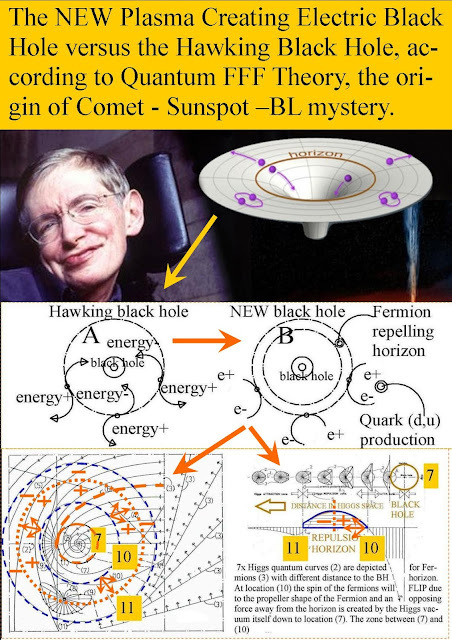 see also: Down going Micro BH hotspots cleaning the vacuum of the oscillating Higgs field for fast super lumminal charge transport. 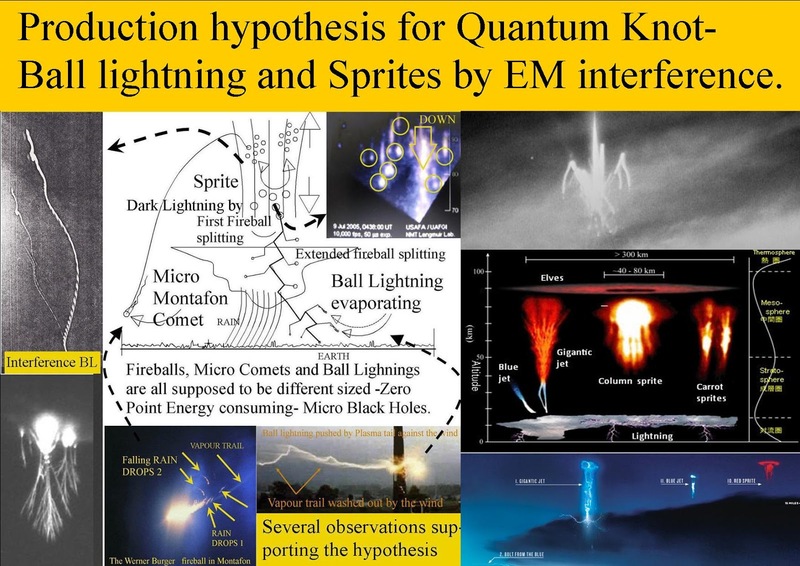 see also: Ball Lightning, Micro Comets, Sprite-Fireballs, Solar Bright Points and Xray/Gamma Flashes according to Quantum FFF theory. 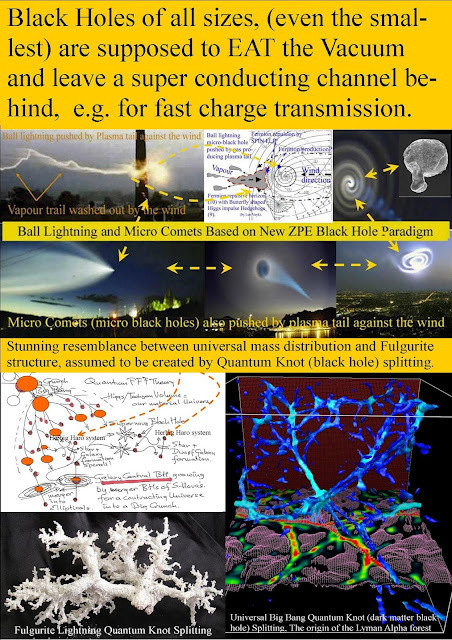 Silicon Based Ball Lightning Globule Structures and Signs For accumulation and retarded decrease of tunneling energy bullets. B: by a new GPS alike position at the surface of the moon. 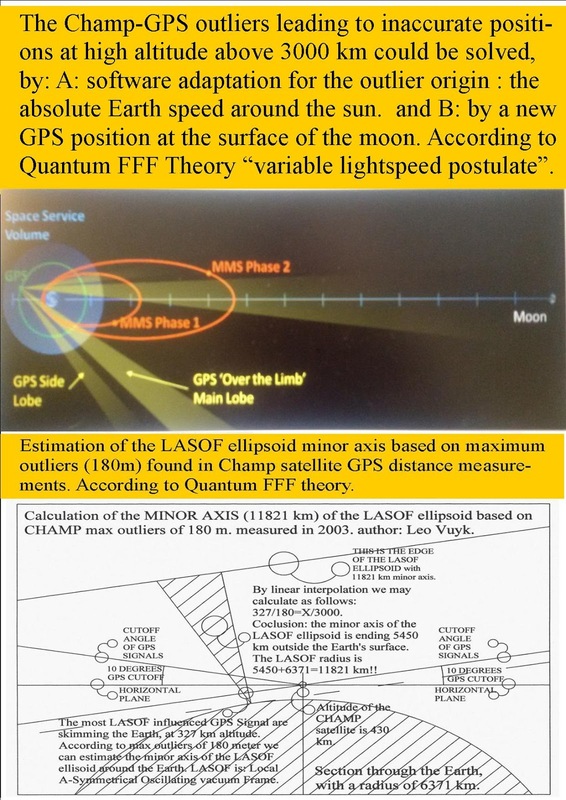 According to Quantum FFF Theory “variable lightspeed postulate”. Einstein did already suggest a possible variable lightspeed. The principle of the constancy of the speed of light can be kept only when one restricts oneself to space-time regions of constant gravitational potential. Einstein "did not need the ether" mathematically, so he stopped thinking to make it more complex. 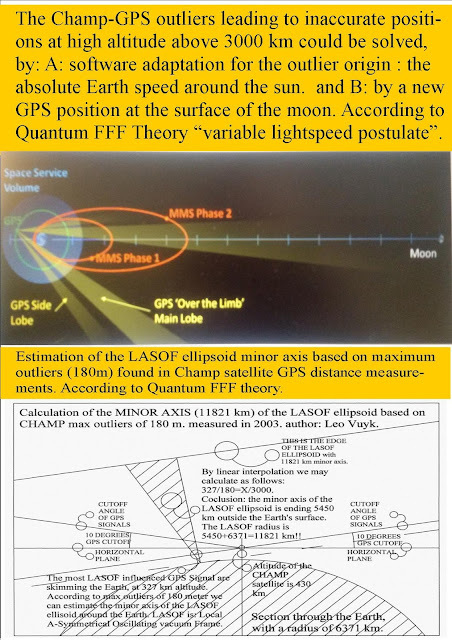 However in Quantum FFF Model, the gravitational potential is subject to gravitational linearity from the source. (earth). 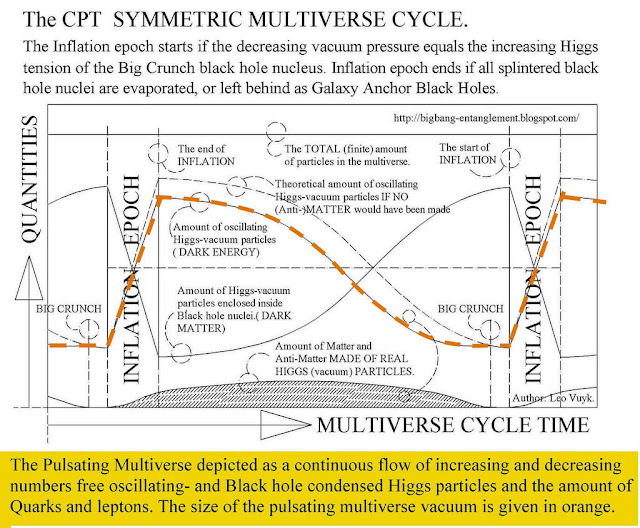 So I suggest a cigar shaped gravitational potential around the earth. called LASOF. 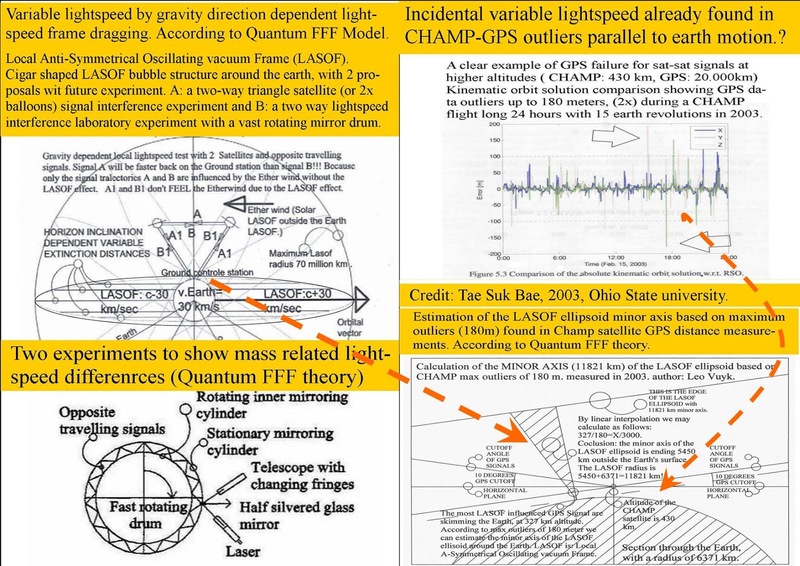 Local Anti-Symmetrical Oscillating vacuum Frame (LASOF). 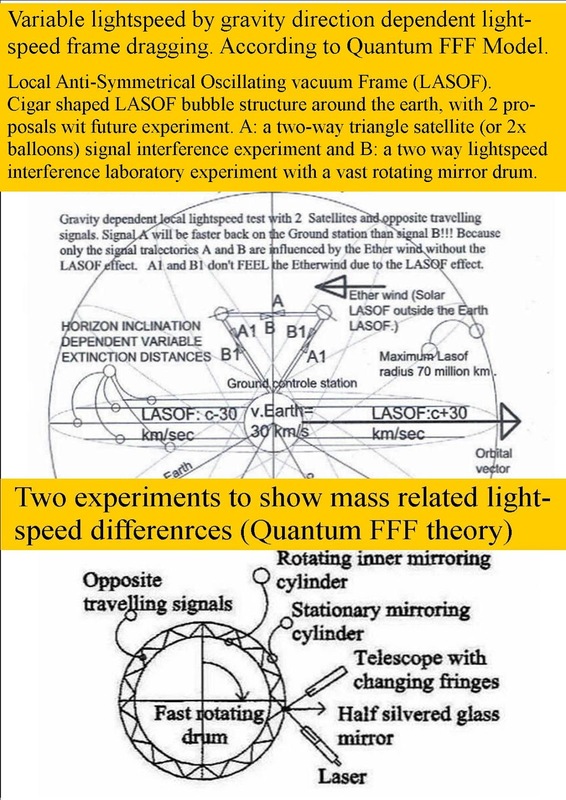 Cigar shaped LASOF bubble structure around the earth, with 2 proposals with future experiment. 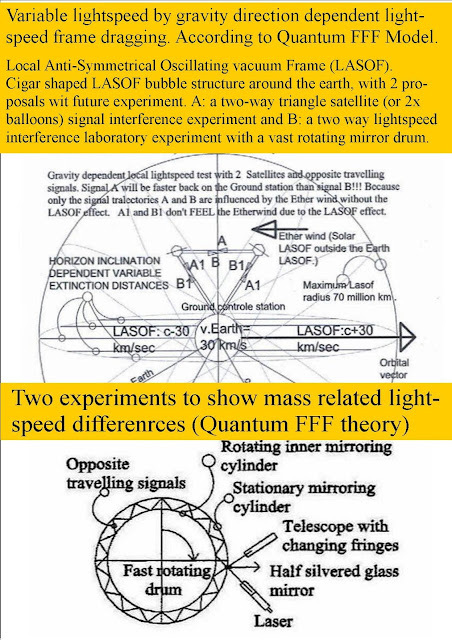 A: a two-way triangle satellite (balloon) signal interference experiment and B: a two way lightspeed interference laboratory experiment with a vast rotating mirror drum. 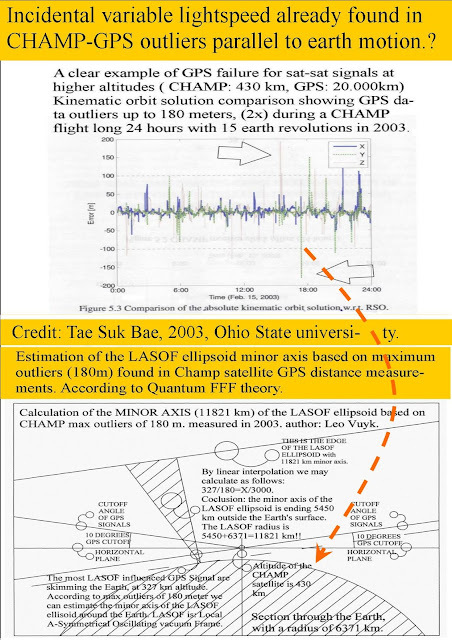 an example: Comparison of the absolute kinematic orbit solution w.r.t. RSO. Tae Suk Bae, 2003, Ohio State university. According to my Quantum FFF Model, the lightspeed is related to massive objects like planets moons etc. A: The Axon-Higgs field pressure (also called Casimir effect) created by the oscillating vacuum lattice. Why 125 GeV Higgs does not decay via 2x bosons into 2x Taus and 2x Bottom quarks? (silver colored, see at the bottom of the poster) . 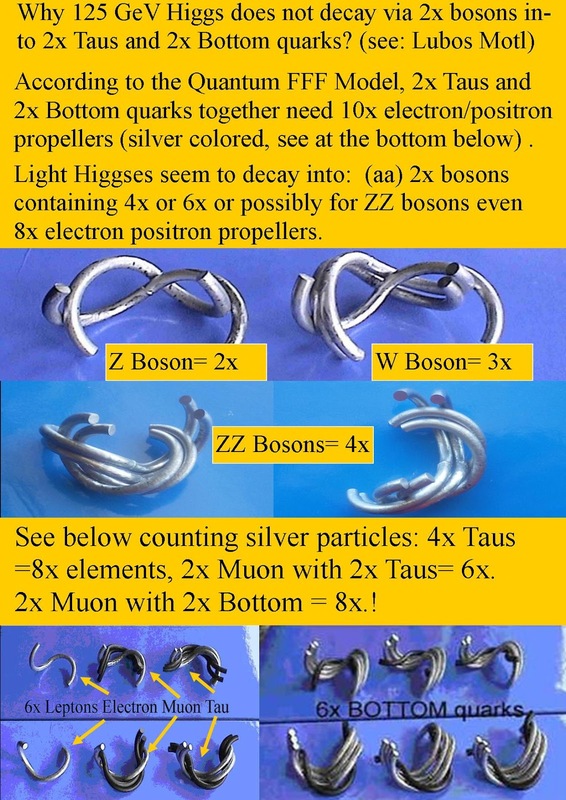 Light Higgses seem to decay into: (aa) 2x bosons containing 4x or 6x or possibly for ZZ bosons even 8x electron positron propellers. 2x Muon with 2x Bottom = 8x.! Lightning (Micro) Black Holes EAT the vacuum (Axion Higgs Field) and leave a temporary superconducting channel behind . In Quantum FFF Theory, Lightning bolts are made of a splitting Quantum knot of real rigid quantum strings, forming (Micro) Black Hole nuclei. They EAT and evaporate into the vacuum lattice (Axion Higgs Field) and leave a temporary superconducting channel behind, E.g. for fast lightning charge transmission. 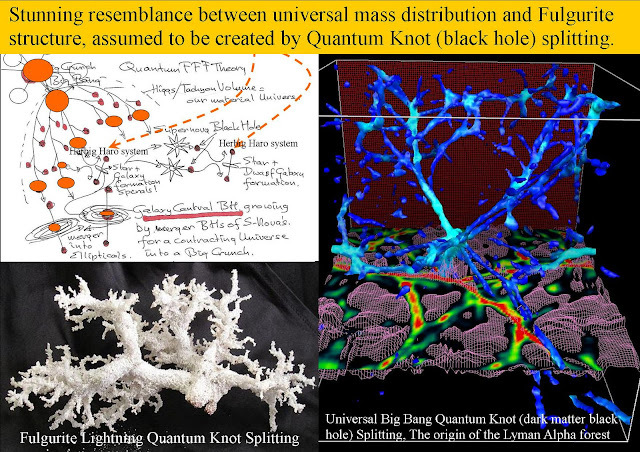 These Quantum knots can have all sizes, from the Big Bang exploding nucleus, to supernova black holes down to Lightning knots. 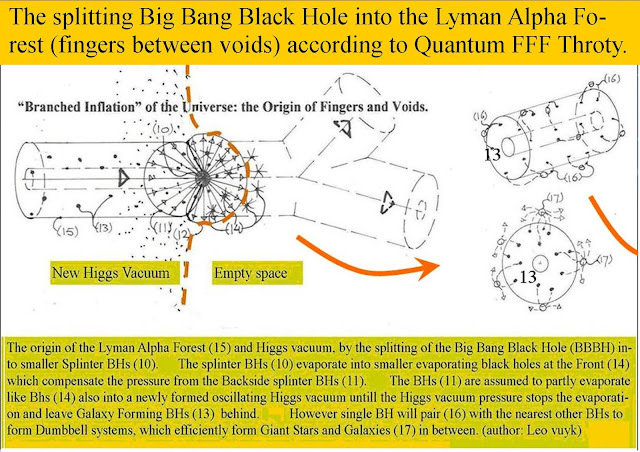 ALL Black Hole SIZES, from Big Bang related Lyman Alpha Forest, down to Lightning channels!! 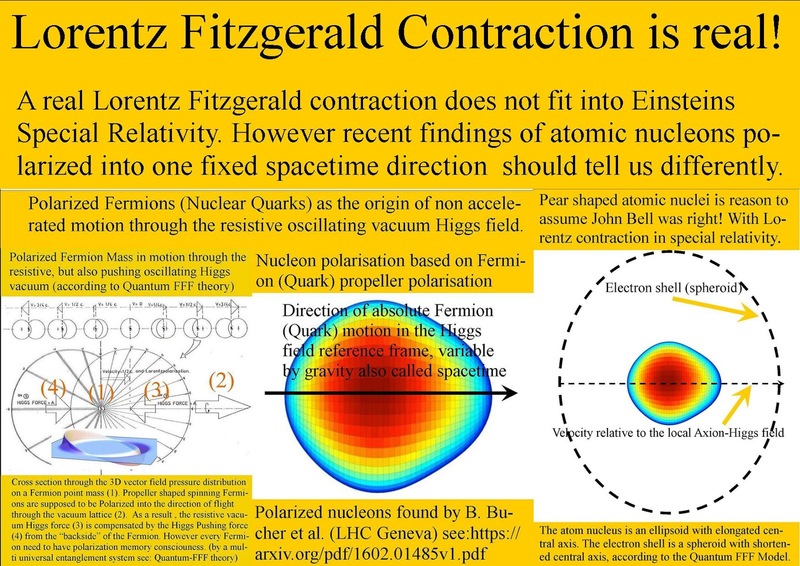 Lorentz Fitzgerald Contraction should be real! John Bell was right ! 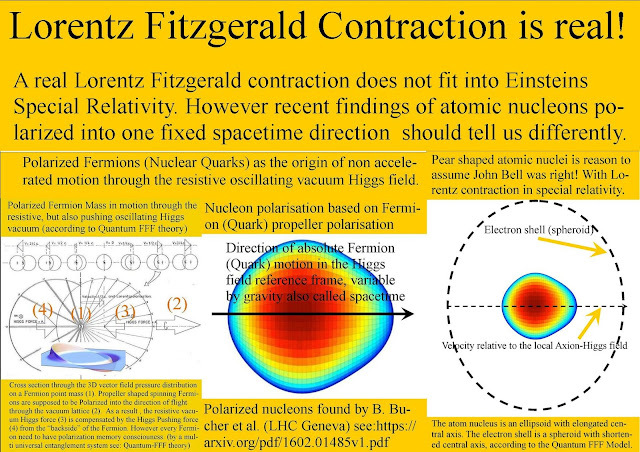 A real Lorentz Fitzgerald contraction does not fit into Einsteins Special Relativity. Einstein did not "need" the ether in his mathematical picture of reality. However recent findings of atomic nucleons polarized into one fixed spacetime direction should tell us differently. John Bell was right in: "How to teach Special Relativity". 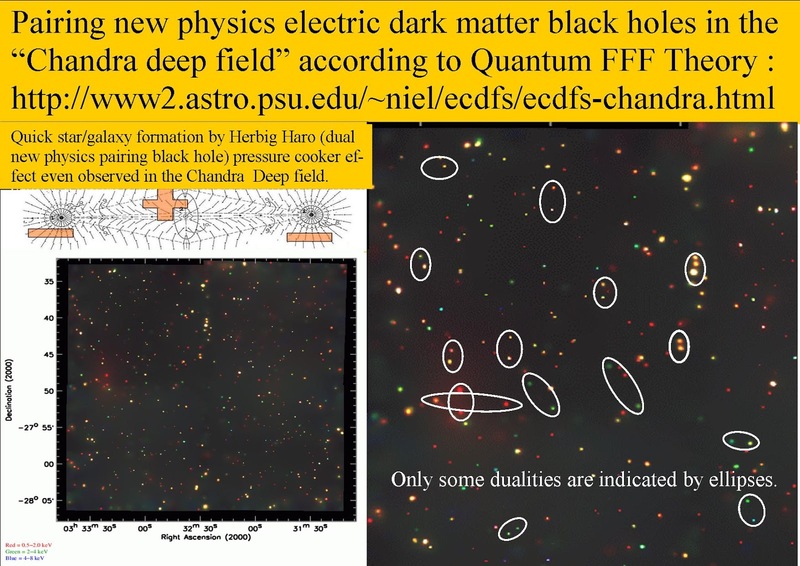 Pairing dark matter black holes in the “Chandra deep field"
Pairing new physics electric dark matter black holes in the “Chandra deep field” also a support for the Big Bang Black Hole splitting process, according to Quantum FFF Theory. Quick star/galaxy formation by Herbig Haro (dual new physics pairing black hole) pressure cooker effect even observed in the Chandra Deep field. 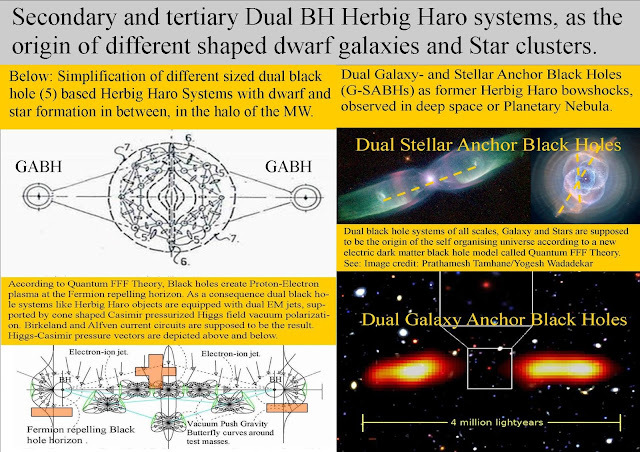 Not only pairing black hole based Herbig Haro systems inside nebula but also in the Chandra deep field.